Aww Nuts! These heart-healthy, certified organic treats are straight from the earth, and always make for a great snacking option! We offer a truly 'gourmet' product. Certified organic, and guaranteed to be fresh and delicious. If you are serious about a healthy, balanced diet, then you should be including at least one serving of nuts and seeds daily. After all, they truly are an easy and handy snack to bring to work, to have at home or to take when you are out on a walk, on a bike ride, or hiking and most of them come fully loaded with vitamins, minerals, and antioxidants. 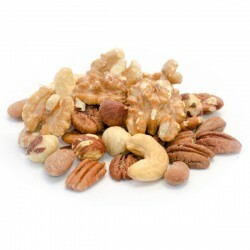 Nuts and seeds contain protein, fiber, and plant stanols, which may help lower cholesterol, and antioxidants including vitamin E. Research shows including a handful of nuts and seeds in your diet actually prevents weight gain and promotes weight loss, provided you control your total calories. The combination of protein, fiber, and fat in nuts and seeds helps you feel full longer, and have also been shown to lower the incidence of diabetes compared to those who rarely ate seed and nuts. So, the next time you have a between-meals craving, walk past those unhealthy chips and instead snack on a handful of these edible treats. They are a fabulous way to satisfy your craving while still staying healthy. There are so many delicious varieties to choose from, you’ll never be bored or stuck for choice. Question is, which ones work for best for you/ Try any of these fabulous alternatives either raw or include them in your cooking, they make a great addition to any recipe. Almonds - the skins, in particular, are rich in calcium, copper, manganese, magnesium, phosphorus, iron, zinc, vitamin E, riboflavin and antioxidants including phenols, flavonoids, and phenolic acids, that are beneficial for heart health. Cashew - a phenomenally rich source of energy, carbohydrates, protein, vitamin E, K, pantothenic acid, pyridoxine, thiamin, manganese, magnesium, copper, phosphorus, potassium, iron, selenium, and zinc. Chia Seeds - rich in omega-3 fatty acid alpha-linolenic acid, antioxidants, vitamins, and minerals including carbohydrates, protein, dietary fiber, niacin, thiamin, Vitamin C, calcium, copper, iron, magnesium, manganese, phosphorus, and zinc promoting lower blood pressure and reduced risk of heart problems. Hemp Hearts / Seeds - contain carbohydrates, protein, dietary fiber, calcium, copper, iron, magnesium, manganese, phosphorus, zinc vitamin E, and both omega-3 and omega-6 fatty acids, which protects against inflammations, atherosclerosis, and some neurological issues. Macadamia Nuts - rich in vitamin B1, magnesium, and manganese and have the highest fat and lowest protein and carb content of any nut including fiber, niacin, pantothenic acid, pyridoxine, thiamin, copper, iron, magnesium, manganese, phosphorus, and zinc. Pecans - crammed with more than 19 vitamins and minerals, and antioxidants including fiber, pantothenic acid, pyridoxine, thiamin, vitamin E, copper, magnesium, iron, manganese, phosphorus, and zinc. Pistachio - contain healthy fats, protein, carbohydrates, dietary fiber, folates, thiamin, Vitamins A, and E, pantothenic acid, pyridoxine, riboflavin, potassium, calcium, copper, phosphorus, copper and manganese, iron, magnesium, manganese, selenium, and zinc. They are also rich in lutein, beta-carotene, and gamma tocopherol. Sunflower Seeds - rich in antioxidant vitamins E, C and B, protein, manganese, selenium, phosphorus, and magnesium and fiber. Sunflowers also contain one of the highest levels of phytosterols beneficial for heart health, immune system, and lowering cancer risk. Walnuts - rich in omega-3 fatty acid, alpha-linolenic acid, copper, manganese, molybdenum, and biotin and antioxidants plus carbohydrates, protein, dietary fiber, riboflavin, thiamin, folates, Vitamin B2, C, E, K, pantothenic acid, pyridoxine, calcium, iron, magnesium, manganese, copper, phosphorus, potassium, selenium, and zinc. Walnut polyphenols help prevent liver damage. Aside from their high nutrition value, nuts and seeds are super portable. You can easily carry them with you wherever you go. You don’t need special containers or carry boxes on your commute, at work or on when travelling. And nuts and seeds enjoy a long shelf life. Packaged by nature. Almost all the nuts and seeds we eat come in safe packages (shells). There is little concern about contamination or handling. Just grab healthy-looking nuts and seeds of your choice and enjoy! Many conventionally grown nuts and seeds require the use of pesticides, which are potentially damaging to our physical and environmental health. By choosing organic, you are not only doing something good for your overall health but also supporting a more sustainable environment. 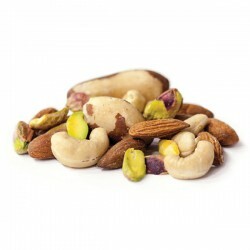 All of the raw, roasted nuts and seeds we sell at Macaw! Foods are certified organic, and we verify their authenticity before purchasing from our our suppliers. Because they contain considerable levels of (healthy) fats, proper storage is crucial in order to preserve freshness avoid rancidity. Here at Macaw! Foods, we always refrigerate and vacuum seal all of our stored products. The products you purchase will be delivered in resealable pouches that we recommend you store away from light, heat or humidity. When stored in the refrigerator, most shelled nuts and seeds will last up to 8 months, and more than 12 months in the freezer. As nuts and seeds are complex whole foods that vary in their nutrient composition, the key to maximizing their nutrition is in the interaction between the vitamins, minerals, fatty and amino acids, fiber, and phytochemicals (carotenoids, flavonoids, polyphenols, and phytosterols) that contribute to health. Rather than focus on one nut or seed, it's best to include a variety in your diet. Pumpkin seeds were once an autumn seasonal snack. Today, they are available all year round. Historia..
Delightfully sweet macadamia nuts are a wonderfully exotic nut packed with important healthy and nut..
Sumptuously hedonistic pistachio nuts have been adored for their wellness properties seemingly since..